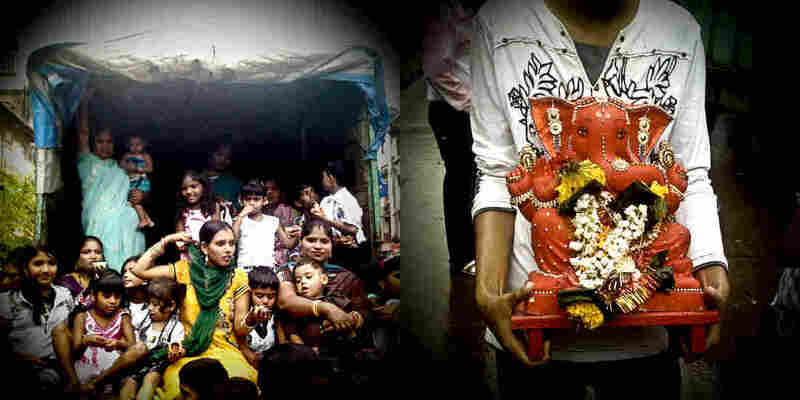 Photographing Ganesh: The Lord Of New Beginnings : The Picture Show Not much brings Mumbai, India, to a standstill, but the annual Ganesh Chaturthi festival does just that. Diptychs offer a glimpse into the merriment and mayhem of the 10-day festival. A year ago I was dancing under the monsoon rain, covered in red powder, surrounded by hundreds of thousands of revelers and dwarfed by a 50-foot statue of Lord Ganesh. Mumbai — my home at the time — had come to a near standstill. Not much can alter Mumbai's daily routine; after all, she's home to an estimated 18 million people. But the annual Ganesh Chaturthi festival provides a spectacular reason to close her streets, divert her traffic patterns and open her seafronts to hordes of jubilant worshipers. 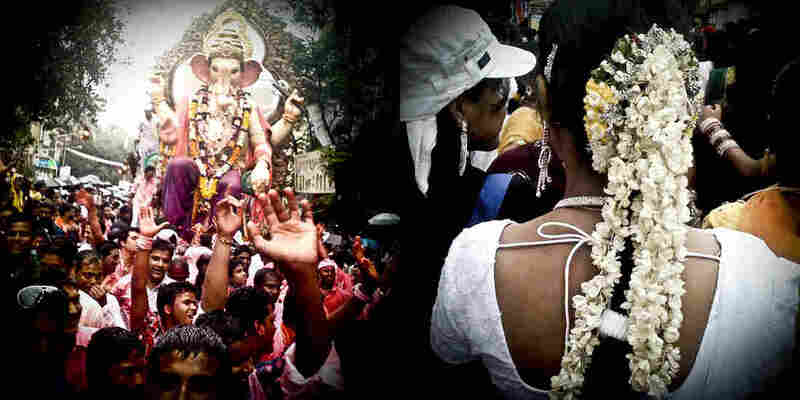 At left, one of the many processions of Lord Ganesh; at right a woman decorates her hair with fresh jasmine. As an expat photographer living and working in India, my senses were on overload from the moment I arrived. Nothing could have prepared me for the chaotic pace of Mumbai. Imagine the simple act of crossing a street here in the U.S. You look left, look right, wait for the green signal, and stroll to the next side. At left, women and children are spared from the monsoon rains; at right, a smaller Ganesh idol decorated with flowers and gold jewelry. Now transport yourself halfway around the world and add a haphazard traffic system, cows and goats roaming the streets, three-wheeled rickshaws whipping past and a plethora of people — commuters, street vendors and beggars. But wait, there's more! Clouds of pollution, heat, humidity, monsoons and the contrasting smells of fresh flowers and raw sewage. To put it simply, it's every aspect of humanity amplified. And when there is a festival, that amp is cranked tenfold. 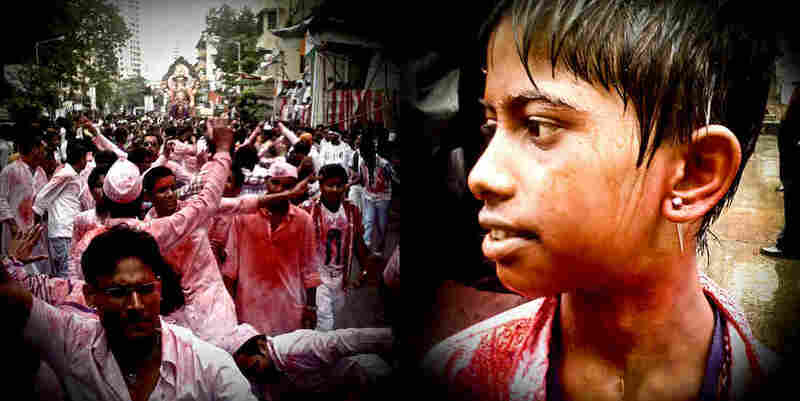 At left, Ganesh devotees dance in front of the idol while leading it to the Arabian Sea, at right, a young reveler covered in red powder and the monsoon rain. As a photographer, the only way to understand and organize chaos around you is through your frame. It calms you down, gives you a sense of purpose and allows you to see things and feel emotions you wouldn't otherwise. That is how I survived Mumbai. Whether I was out with a medium-format film camera or my camera phone, I'd walk the streets and wander through festivals, capturing moments in order to understand the humanity before me. Is it any wonder, now sitting at a desk in Washington, D.C., that I'd get nostalgic for this time of year in Mumbai? At left, black umbrellas are dwarfed by a Lord Ganesh statue; at right, young revelers take a short reprieve from the mayhem. During the 10-day Ganesh Chaturthi festival, Hindu devotees celebrate their Lord Ganesh, a deity widely worshipped as the god of wisdom, prosperity and good fortune. Tradition demands that statues depicting Ganesh are praised through prayer and offerings and then released into the sea, taking away the year's misfortunes and setting the stage for a prosperous future. 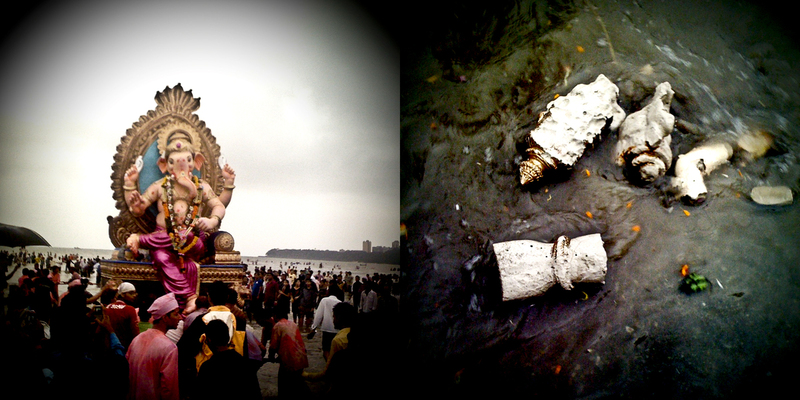 At left, a statue at the base of the Arabian Sea ready to be immersed; at right, pieces of immersed plaster statues scatter the sea front. Each year revelers try to top the previous year's celebrations. The statues get bigger, the music louder, and the festivities go all night. From Bollywood stars to street vendors to curious visitors, everybody is invited to celebrate. And for this photographer, even after walking miles in the monsoon rain, avoiding being flattened by an elephant God on wheels and suffering quizzical stares from locals, it will forever remain the thrill of a lifetime. 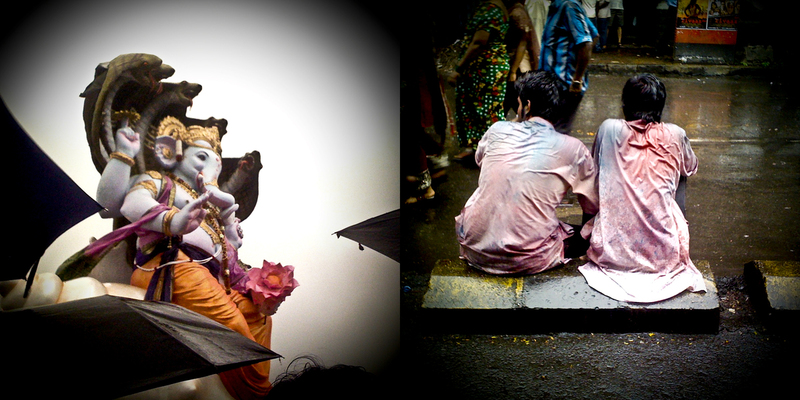 Editor's Note: All images were taken with a camera phone during the Ganesh Chaturthi festivities in Mumbai, India, September 2011.